The Wizard of Oz is my favorite movie. I watch it on video at least once a week. 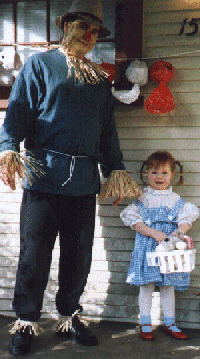 I even dressed up as Dorothy for Halloween in 1997, and my daddy dressed up as the scarecrow. Here is a picture of us! I also love to watch a video of The Wizard of Oz in Concert, which was performed on stage in 1995 and has been on TV a few times. It starred Jewel as Dorothy, Jackson Browne as the Scarecrow, Roger Daltrey as the Tinman, and Nathan Lane as the Lion. And this October, for my 4th birthday, my mommy had a Wizard of Oz birthday party for me! Click on the ruby slippers to see pictures from the party.